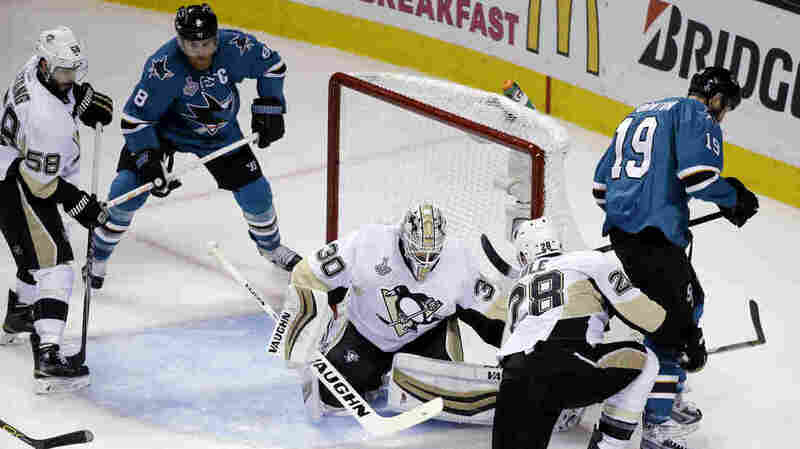 Stanley Cup Inspires Artwork Bet, Highbrow Trash Talk Between 2 Museums The Pittsburgh Penguins and the San Jose Sharks are going head-to-head in the Stanley Cup finals. To up the ante, art museums from the two cities decided to get in on the action. Pittsburgh Penguins goalie Matt Murray (30) defends against San Jose Sharks' Joe Thornton (19) during the second period of Game 4 of the NHL Stanley Cup final on Monday in San Jose, Calif.
Maybe art's fair in love and war. While the San Jose Sharks and the Pittsburgh Penguins compete in the Stanley Cup Finals this week, museums from each city are wagering pieces from their collection that their hockey team will come out on top. It all started on May 27, when the Carnegie Museum of Art in Pittsburgh challenged the San Jose Museum of Art to a friendly bet on Twitter. Hey @sjmusart, how about a friendly little wager over this Lord Stanley thing that's about to go down? If the Sharks win, the CMOA will loan "Measurement: Plant (Palm)," a 1969 conceptual work by Pittsburgh-born artist Mel Bochner. If the Penguins win, SJMA will have to relinquish "Mom Posing by Green Wall and Dad Watching T.V.," a 1984 photograph from the "Pictures from Home" series by California artist Larry Sultan. It's a bit of an uneven playing field: not only does the CMOA's collection of 30,000 pieces far exceed the SJMA's 2,500, but the Penguins are currently leading the Sharks 3-1 in the series. This is just the latest artistic fun around a sports event. The Seattle Seahawks and the New England Patriots inspired a similar bet during the 2015 Super Bowl, wagering a pair of seascape paintings. When the Patriots took home the Vince Lombardi Trophy, the Clark Art Institute in Williamstown, Mass., took home the 1870 Albert Bierstadt painting "Puget Sound on the Pacific Coast," which it won for three months from the Seattle Art Museum. And more than just photographs — and, yes, the Stanley Cup — are at stake. Sen. Bob Casey, D-Pa., put up a bottle of Pittsburgh's own Wigle Whiskey against a bottle of California chardonnay from Sen. Dianne Feinstein, D-Calif., and per tradition, Mayors Bill Peduto of Pittsburgh and Sam Liccardo of San Jose wagered on their cities as well. Hey @SenFeinstein, a bottle of Pittsburgh’s own @WigleWhiskey says the @penguins take the #StanleyCup over your @SanJoseSharks. In addition to a gift basket of city-appropriate goods (a Primanti Bros. sandwich vs. La Victoria Taqueria orange sauce), the losing mayor will make a donation to the winning mayor's charity of choice. And while the losing mayor will donate a captain's jersey to charity as well, he'll need to take a photograph in it first — to prove his concession. At least neither will have to shovel snow, like the former mayor of Pittsburgh, Luke Ravenstahl, had to do for a Greenfield, Pa., church after the Steelers lost to the Green Bay Packers in the 2011 Super Bowl. The Stanley Cup Finals continue Thursday night at Consol Energy Arena in Pittsburgh. Smack talk, however, has already begun, delivered in the way museums know best: artfully. Gabe Rosenberg is a digital news intern.